The San Luis Obispo City Council voted unanimously to ban the use of expanded polystyrene (EPS) containers at a June 2 meeting. The ban applies to all disposable food and drink containers sold in the city, and will be implemented in stages, beginning in six months. YOU WANT THAT TO GO? 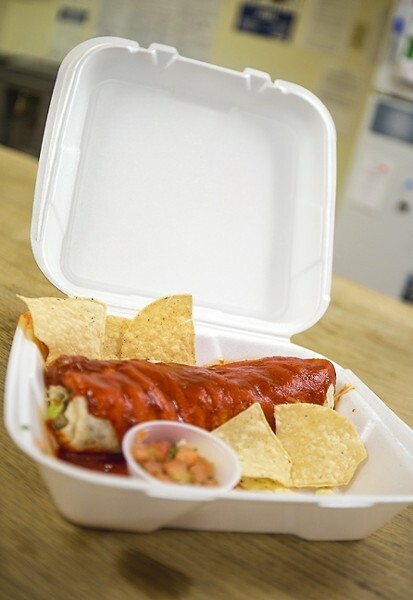 : SLO City Council voted to ban expanded polystyrene containers June 2. The ordinance goes into effect in about six months. The ban applies to all food containers. City staff began looking into the ban in March after receiving complaints from community members that EPS containers were a significant source of pollution in local waterways. According to a city staff report, EPS is the second most common type of beach debris on California beaches. The ordinance applies to all city food providers, including restaurants, caterers, cafeterias, grocery stores, delicatessens, and mobile food vendors. Additionally, EPS containers are supposed to be replaced with recyclable, biodegradable, or compostable containers. More than 80 cities in California already have similar bans in place. Jimmy Graton, who goes by “Frank Furter,” is the general manager of Frank’s Famous Hotdogs in SLO. He said they anticipated the ban and were already looking into alternative products. Vendors have six months to make the change, after which time there will be another six-month grace period where violators receive a written notice with no fine. The ordinance is expected to be enforced through a complaint-based process. When the ban goes into effect, customers can call city Code Enforcement to report violators. Vendors can also apply for a one-time, one-year exemption if the ban creates financial hardship.